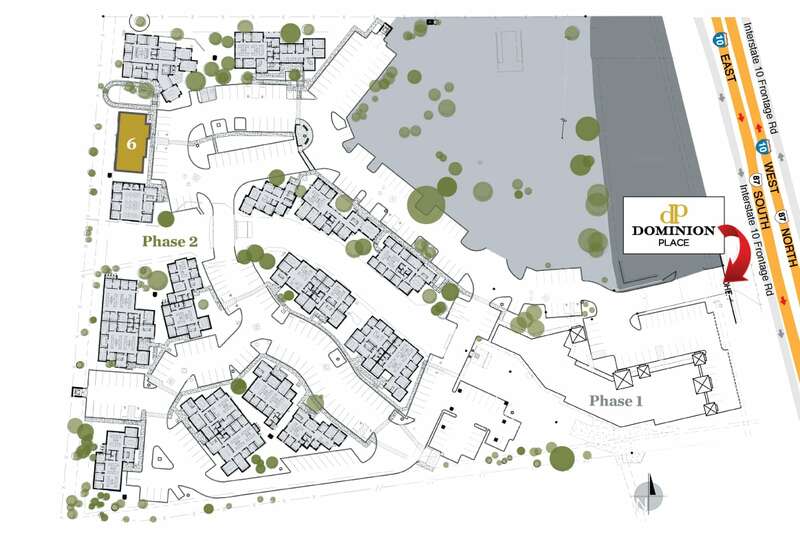 Dominion Place is a 9.5–acre commercial development in north San Antonio, Texas offering prime retail and office suites for lease, and custom stand–alone garden office space—for sale or lease. Dominion Place is strategically located on Interstate 10, next to the new Tesla dealership and near the affluent neighborhoods of The Dominion, Stonewall Ranch & Fair Oaks. Our custom garden office and retail suites are conveniently located near the award-winning Dominion Country Club and Golf Course. Dominion Place is offered by Elmco Real Estate, a sister company of luxury homebuilder Image Homes, Ltd.
“We feel this is a unique concept that allows small–to–medium–sized businesses a working space that is not attached to other offices” says Roberto Kenigstein, owner of Image Homes. Phase 1 of the commercial development features prime retail and office suites for lease. Phase 2 of Dominion Place boasts modern garden office space. Buildings are currently under construction, and available for sale or lease. The stand–alone garden office suites, designed by San Antonio–based architecture firm Drewry Martin, Inc., will be customized both inside and out, ranging in size from 1,500 to 9,500 square feet. Hill Country and urban–infused features include limestone, metal roofing and landscaped green space. Once fully constructed, Phase 2 of Dominion Place will feature 15 custom garden offices. Choose a building in the site map below for building specifications, square footage, and layout and configuration options. Elmco Real Estate, Ltd. – established in 2009. Roberto Kenigstein founded Image Homes in 1988 and has served primarily The Dominion residential community as a leader in creating award-winning, luxury single-family homes. The firm entered the commercial real estate market in 2008 with the construction of Shavano Commons Business Park − 20 luxury stand-alone office suites located within Loop 1604 between Lockhill Selma Road and NW Military Highway, also the site of Image Home headquarters – and founded Elmco Real Estate in 2009. The firm’s second office park project, Huebner Gardens, is located at 14603 Huebner Road.